Trainers David Eustace (l) and Ciaron Maher (r) have high hopes for Wall Of Fire at Randwick. After a long and gradual build-up from injury, Wall Of Fire will attempt to win the Group One Metropolitan Handicap over 2400m at his first start for almost a year. An international visitor for last year’s Melbourne spring carnival, Wall Of Fire ran second in the Herbert Power Stakes (2400m) in his first Australian outing before finishing 16th in the Melbourne Cup. 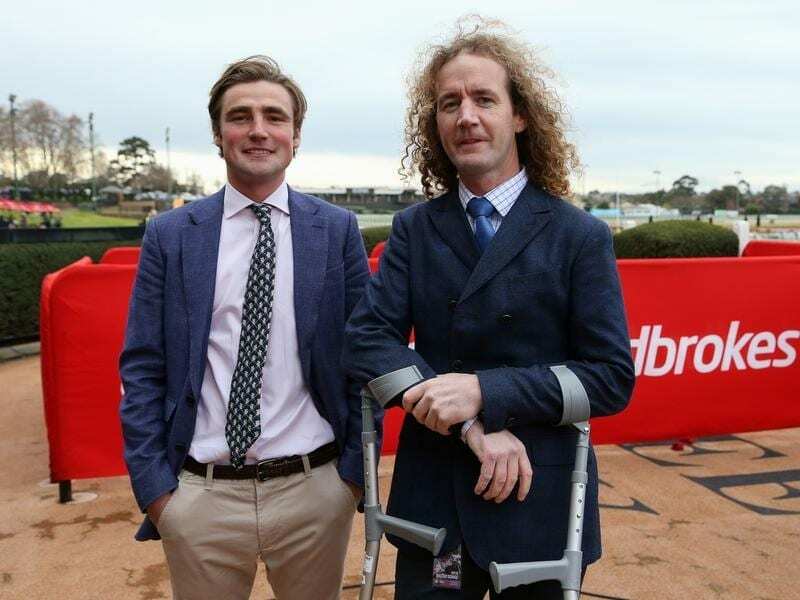 Then trained by Hugo Palmer, Wall Of Fire is now prepared by Ciaron Maher and David Eustace in Melbourne and is set to make his race return in Saturday’s staying feature at Randwick. “He had an injury after the Melbourne Cup,” Eustace said. “He did a suspensory ligament which is not uncommon but obviously fairly serious. He’s had rehab for quite some time since then and been in work for the best part of eight months. “It’s been a long, gradual prep. “He’s been at the farm at Pakenham, he’s spent a bit of time at Caulfield and he’s been at the beach. “Crucially he’s come through his three barrier trials well. The stable has opted to step the horse out over a staying distance for his return with three Cranbourne trials over 1550m under his belt. “It’s obviously a bit of a gamble but he’s had plenty of work,” Eustace said. Wall Of Fire holds nominations for the Cups and Eustace hopes the talented stayer stays sound. “That’s obviously the big question mark but if he stays sound then the form is in the book and we think he’s come up well,” he said.